I received THE FALL LINE: A Tale of Old Jamestown to review as a member of the Dorrance Review Team. 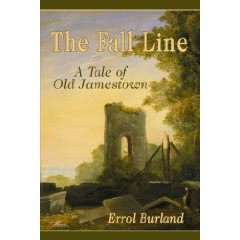 THE FALL LINE: A Tale of Old Jamestown by Errol Burland, is set in the 1600's that details the lives of Lyn Duke, John Grey and Nat Bacon who uproot from Suffolk, England in 1660 to Virginia. Lyn and Nathanial are neighbors who marry and take along their good friend John to this fertile, dangerous new land. The destiny sought by these three is one of peace and comfort but due to the early age of this colony, fights among Indians and other conflicts thrown their way, they quickly learn it's not all they dreamed of. The characters are well developed and include Nat's cousin, an affluent tobacco plantation owner, who welcomes the three to Virginia. Along the way they meet and befriend other influential men and learn that a deep seeded divide is approaching. The two factions, the Green Spring and the Ring divide the colony and force the emigants to choose. Nat chooses the group that opposes the governor which is in direct conflict to his cousin who has significant ties to the governor. The story details Nat's bestowed appointment to lead the Ring against the Indians and then against the Green Spring to the eventual charge of being a traitor to the King of England. Nat becomes knowns as General Bacon and thus the story details Bacon's Rebellion. It's a detailed, engrossing depiction of the political strife that was wide spread in colonial Virginia through the eyes of a few. One ends up feeling remorse for Lyn who loses so much on this path that turned out much different than expected. I recommend this book to anyone who likes historical novels given the great historical detail present as well as seeing the human component suffered during war and conflict. It's a great book!